As a modern-day counterpart of literature's famous castaway, a navy pilot stranded on a desert island soon realizes that the other Crusoe never had it so good. This time, Crusoe discovers an exotic girl, whom he dubs "Wednesday", and organizes an entire squadron of island beauties against the island's evil ruler. Adding to the fun is a poker-playing chimp named Floyd and enough comedy, romance, adventure and pure escapism to keep all the natives restless with laughter for many moons. Or find "L.T. 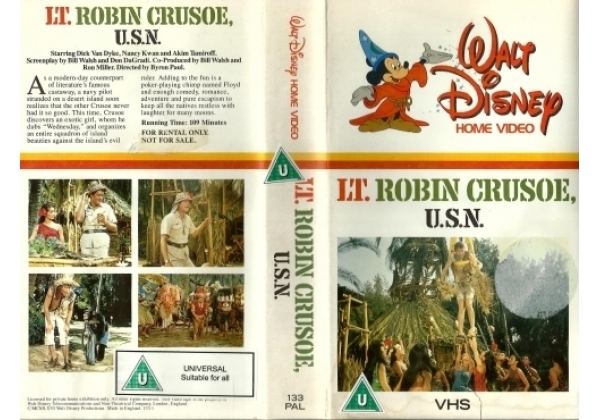 Robin Crusoe" on VHS and DVD / BluRay at Amazon.